So, I was working on Rant Central yesterday and ran into a problem accessing some of my domain resources. So I decided to contact tech support via their web chat application. 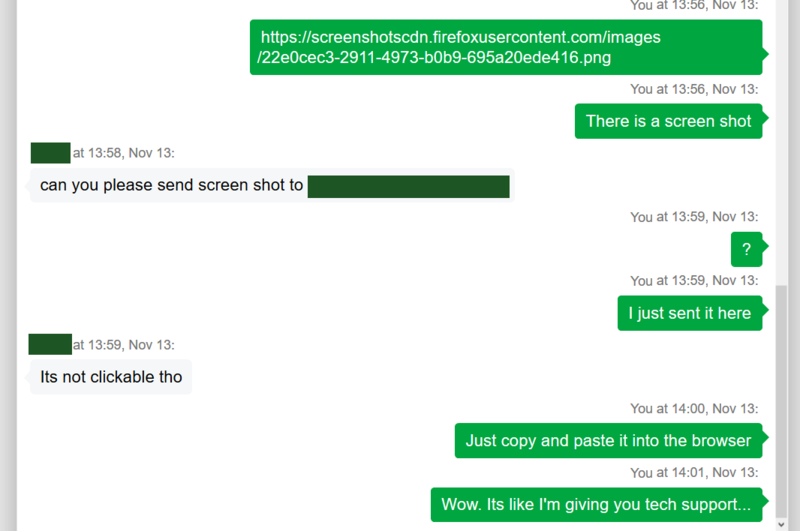 I posted it on Reddit as it was happening...I just couldn't believe this person was responsible for helping me, but didn't even have basic computer skills. I do want to add that in my message I was a little rude, and felt bad about it immediately. I was just so shocked that I was having to coach the tech support person through something like it was my grandma or someone. Have you ever dealt with a tech support agent who didn't know what they were doing? No way. By the time we got to the end, it was evident that they were either very young and/or extremely unskilled with computers. (11-18-2018, 09:33 AM)Wildcard Wrote: No way. By the time we got to the end, it was evident that they were either very young and/or extremely unskilled with computers. From what I remember at work. They had I.T.specialists rated in categories...Stage one was like the password reset guy, The guy that would suggest you reboot the system, etc...Then you would be "escalated" if they couldn't figure it out. Usually, the people right out of school not knowing the specifics would get that position. (11-14-2018, 10:26 AM)Wildcard Wrote: So, I was working on Rant Central yesterday and ran into a problem accessing some of my domain resources. So I decided to contact tech support via their web chat application. Once, I contacted my previous hosting company wanting to have a static IP address for one of my subdomains. The "tech person" kept on asking me WHY did I want this? I said because I have my reasons and Yes, I know this will be an additional charge. I had no problem paying extra for this. Again... this "tech person" was perplexed (that's the only word I can come up with) as to why I wanted a static IP address for a subdomain. I basically told this person that I read the hosting contract and it is permitted if I made the request... so I relayed that to the "tech person" and stated clearly and forcefully that I am making this request NOW. That "tech person" must have had a major brain fart or something and kept on wondering why I was asking for this. I basically told this person... "Look, it might be out of the norm for you, but can you just do what I am requesting and stop asking too many questions?". Then, I said... put me through to your supervisor/manager now. To my surprise, she did. Within 5 minutes, I was talking to the supervisor. Explained the whole thing all over again... the supervisor didn't question my request and gave me the static IP address for the subdomain. I told the supervisor that he needs to review the conversation and see how dumb that first "tech person" was. He said that he would. That was one of my more frustrating experiences with a "tech support" person. 6 months later, I ended up switching hosting providers. Not for the above mentioned reason, but for other reasons that I won't go into detail here. ^^ Another thing I forgot until reading this... Some "tech" people are not tech at all. This doesn't only apply to computer people, but ANYone in a particular job function. So in a weird way when I read these stories, I'm hopeful that they are not just Uberly bad at the jobs they were trained in, but maybe they were just off the street dopes with no experience at all??? That would at least provide a better explanation as to their incompetence level...Plus, these companies probably don't have to pay as much. As far as the supervisors??? Please, some of them are WORSE than the workers... Again, this is just a general corporate politics statement than a tech position one, but I can see where it would apply in that field as well. you don't need an education nor knowing anything about the specific tech to be a Tech Support. they read of the answers of their computer screens anyways. its kinda sad if you think about it to be honest that they don't need any form of training or education for it. It's even sadder when they don't even know their own guidelines / TOS.